A British-American musician reflects on her long life and colorful career as a folk singer. Seeger (b. 1935) grew up in a musically gifted “family of left-wingers.” Her father was a musicologist who regularly consorted with the likes of Alan Lomax and Lead Belly; her mother was a music teacher, composer, and Guggenheim Fellowship recipient; and her half brother, Pete, was a highly regarded folk singer and social activist. As middle class as her upbringing was, the author also remembers it as “strangely free—few dos and fewer don’ts.” A lively teenager who played numerous instruments including the banjo, Seeger attended, but did not graduate from, Radcliffe College. While a student in Boston, she took part in the emerging folk music scene. In 1955, she left to live in the Netherlands. A phone call from Alan Lomax in England brought her to London in 1956, where she immersed herself in the burgeoning folk music scene of which Lomax was part. Almost immediately, she met and began an affair with English musician Ewan MacColl, who was 20 years older and married. Together, they formed an unconventional, peripatetic union that produced three children; seminal documentary collaborations with the BBC called the Radio Ballads; the Critics Group, a master class for young singers interested in learning the art of folk music; and numerous albums now considered classics of the folk genre. Their intense, sometimes-difficult personal relationship also inspired MacColl to write “The First Time Ever I Saw Your Face,” a song made famous in the early 1970s by Roberta Flack. 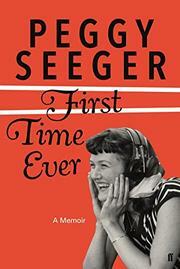 Spanning the U.S., Europe, Asia, and a personal evolution toward feminism and bisexuality, this free-spirited recollection of eight decades steeped in joy, sorrow, and harrowing tragedy celebrates Seeger’s experiences while reveling in the free-spirited “Of-Course-Why-Not” philosophy that has governed her life. It’s a remarkable life story well told. A quirky, unique, and fabulously memorable memoir.